Relatively speaking the United States is a newcomer to the worldwide brewing scene. Prohibition was a major blow to the brewing industry in this country, and in the decades that followed mergers and acquisitions consolidated the brewing capacity of our nation. By the 1970s all that was left was a handful of industrialized megabreweries intent on brewing beers largely absent of individual character. When microbreweries and brewpubs started to emerge from this apocalyptic wasteland in the 1980s the beers embraced by most small breweries were modeled after British styles—pale ales, India pale ales, porters, and stouts. Over time brewers pushed the boundaries of those styles until they morphed into something that was distinctly American. The double IPAs and barrel aged, coffee infused imperial stouts that are so popular today bear about as much resemblance to their British forbears as baseball does to cricket. Following not too far behind was a wave of American beers influenced by Belgian brewing traditions, like saisons, abbey ales, and witbiers. For reasons that are not entirely clear to me American breweries have been slower to come around to putting their spin on German beer styles. Perhaps because of the traditional, conservative streak that permeates German brewing (can anyone say Reinheitsgebot), or maybe as a backlash against the fizzy yellow American macro lagers that are diluted versions of German and Czech beer styles. Stepping into this void is Columbus’ Zauber Brewing who specialize in both traditional and modern interpretations of German and Belgian styles. 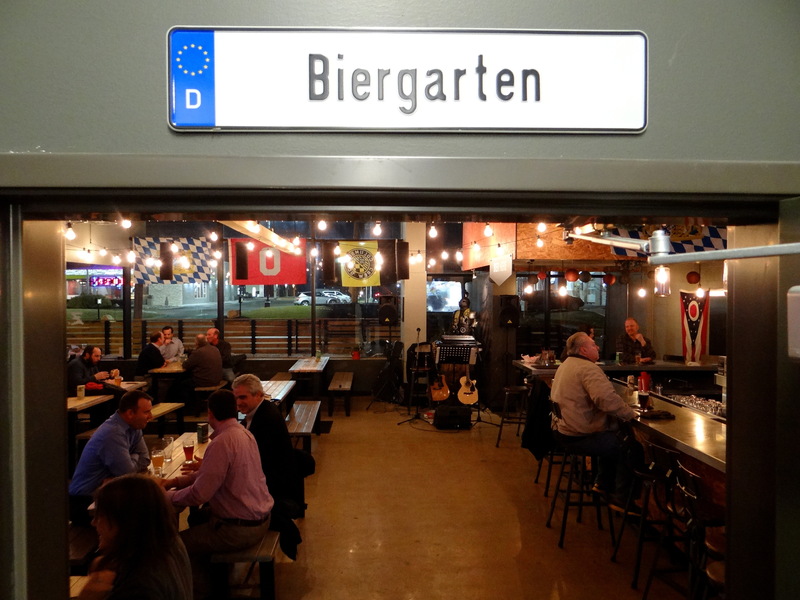 Columbus, whose history is rich with connections to Germany, is a fitting location for a German inspired brewery. It’s no coincidence that the Brewery District, home to five thriving breweries in the late nineteenth century, is located in German Village. 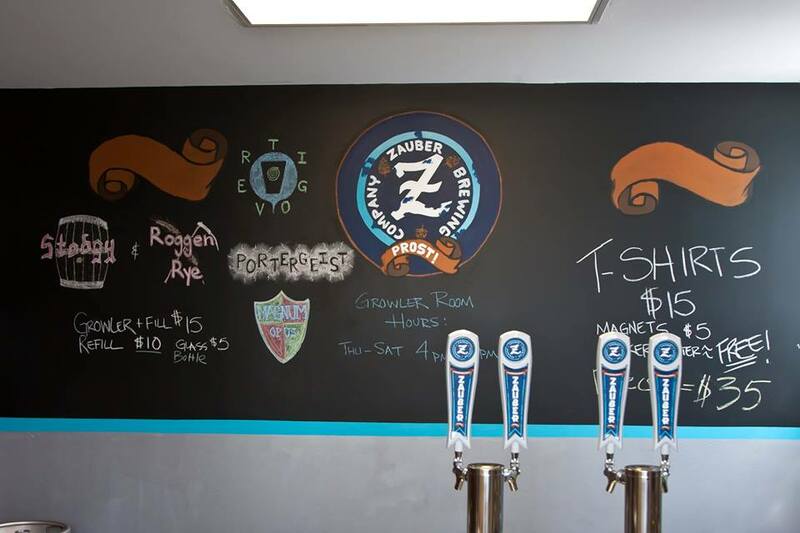 Interested to learn a little more I headed over to Zauber last month to visit with head brewer Cameron Lloyd and owner Geoff Towne. You could say that Geoff’s journey from beer lover to brewery owner has been a long and winding road. He started as a traveling salesman for a packaging company, a gig that involved servicing breweries and wineries in New York and Pennsylvania. During those visits he realized that starting a small scale brewery was an attainable goal. So he packed his bags and headed to west to California where he completed the Master Brewers program at UC Davis. The next step in the journey brought him to Ohio where he spent two years working at Great Lakes Brewing in Cleveland, followed by a one year stint at the Boston Brewing Company facility in Cincinnati. After cutting his teeth with some of the most successful breweries in the business he felt the time was right to strike out on his own. Leaving behind the security of a full time job he took the plunge and started Zauber in 2012. The beginnings were humble, small batches sold as growler fills in a room off an alley in Grandview. 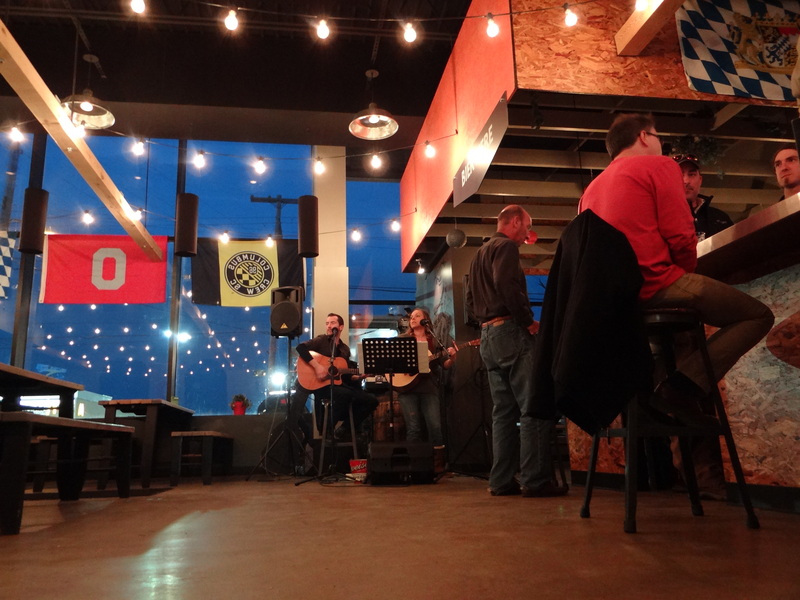 Prompted by the availability of a much larger space next door, Zauber moved into the current tap room on West 5th Avenue in January of 2014. The space is modeled on the German beer hall concept with rows of wooden communal tables and strings of light bulbs hanging from the ceiling. If you are so inclined you can drink beer from one liter mugs (only $6 per mug on Mondays!) for an even more Teutonic experience. European football matches are often playing on the two flat screen TVs mounted on the west wall. The soccer friendly atmosphere is further bolstered by the scarves of national football (soccer) teams from Ghana to Portugal to Chile that adorn the walls. There is even a suit of armor in one corner sporting a Columbus Crew scarf. Although it lacks a moat or proper battlements to withstand an extended siege, a food truck is always present on the patio so you need not go hungry. At the time of this writing one of my favorite food trucks, The Explorer’s Club, has taken up permanent residence. Expansion to the current space was not without some growing pains. The move was not accompanied by a simultaneous expansion in brewing capacity, which created a mismatch in supply and demand. Every Thursday batches of two Zauber beers were tapped, but the demand was so high that often those kegs blew before the weekend could arrive. 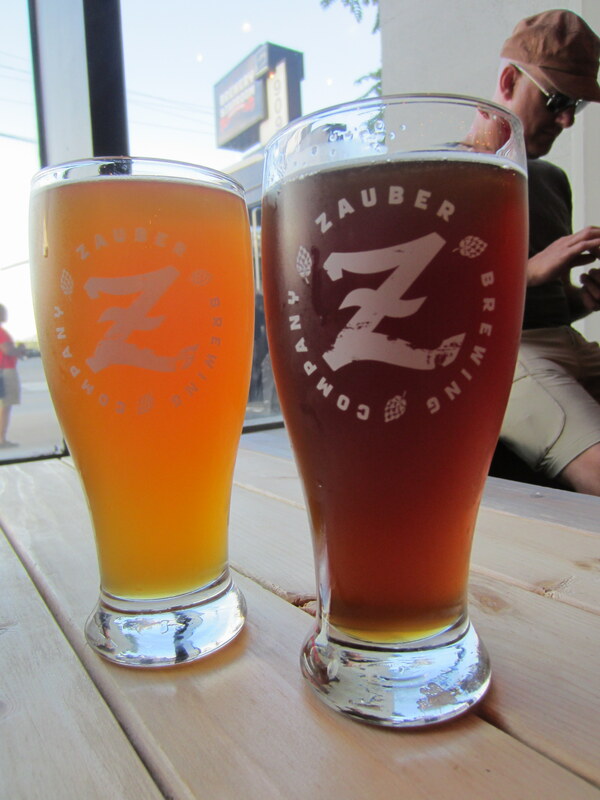 For the rest of the week there was no Zauber beer pouring at the brewery. I understand the reasons behind the lag, lining up funding for a brew system is a major hurdle, but it still felt kind of strange that it took me three trips to the taproom before I was able to try my first Zauber beer. That all changed this summer when a shiny new 20 barrel brewkit was installed, and I’m happy to report that nowadays one can find 6-8 Zauber beers on tap at all times. The arrival of the new brewkit meant more brewing, more distribution, more bookkeeping, all of which made the one man brewing operation untenable. So Cameron Lloyd was brought on board as head brewer. Like Geoffe, Cameron has a formal training in brewing. He’s a graduate of the venerable Versuchs und Lehrenstalt fur Brauerei (VLB) in Berlin (English translation = Research and Teaching Institute for Brewing). He cut his teeth working with craft beer pioneer North Coast Brewing, which is located in the picturesque but remote northern California coastal town of Fort Bragg. Although there is a certain appeal to living in a small town (Fort Bragg has a population of roughly 7,250), let’s just say it comes with some limitations as well. So when Cameron’s girlfriend, who works for Nationwide Insurance, had a chance to relocate they decided to head east and come to Columbus, which is not a bad place to land these days if you are a brewer. 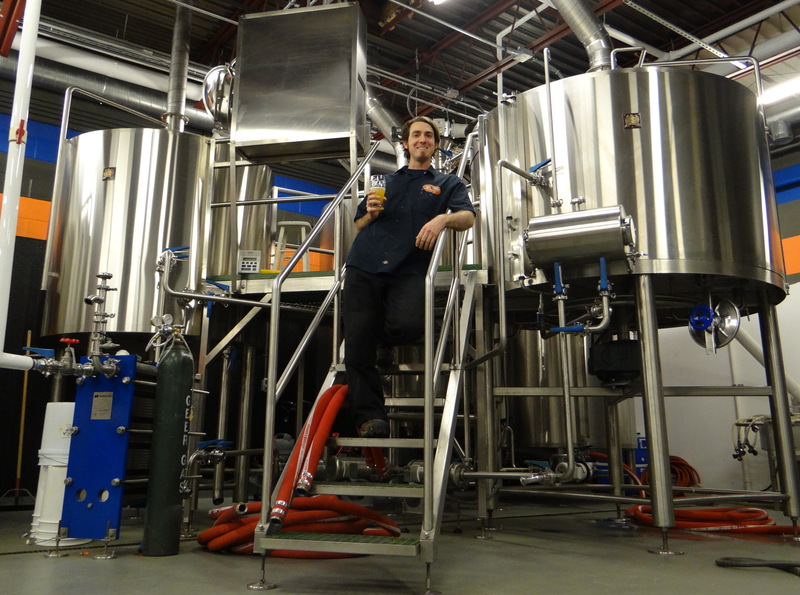 Head brewer Cameron Lloyd and the shiny new brewkit at Zauber. When I arrive on a dark and cold Tuesday evening Cameron is waiting at the bar, happy to talk shop and take me on a guided tour through the taplist. Geoff and Cameron may have similar backgrounds but their personalities are pretty different. Geoff is über laid back and somewhat close to the vest with the details about his beers and opinions of the brewing scene as a whole, while Cameron is confident and not hesitant to speak his mind. I’m curious to understand what it means to put an American spin on German and Belgian beers. Cameron tells me the best way to explain it is to let the beers speak for themselves. Of course in a literal sense beer can’t speak for itself, nor to my knowledge do any fermented beverages write a blog, so I’ll have to translate. 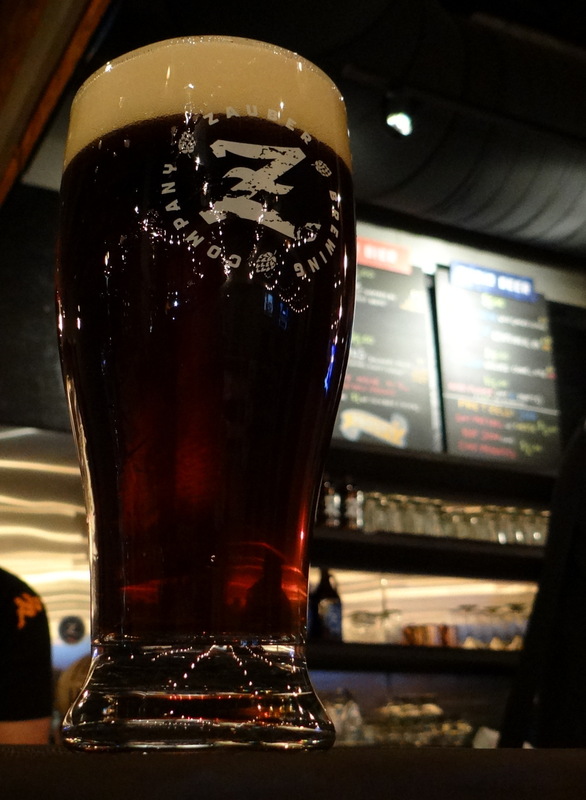 Sit back, grab a cold one and let’s get up close and personal with the magical beers of Zauber. We start with one of my favorite Zauber beers, Vertigo. The hazy appearance and banana nose tell you right away that this is a traditional German hefeweizen. The taste is nice mix of banana and clove with hints of vanilla. Cameron tells me that unlike many American brewed hefeweizens they don’t scrimp on the wheat. Apparently the high protein content in wheat malts leads to a viscous wort that can be tricky to deal with, but the new brew system at Zauber is able to handle a malt bill that is 50% wheat, as is traditional for a hefeweizen. In my opinion Vertigo can hang with some of the better German hefeweizens on the market, with the distinct advantage that it’s brewed fresh locally. While Vertigo is brewed to style, Buxom Blonde is a little more adventurous. Nice fruity notes, including some of the banana flavored esters found in the hefeweizen, are also present here, but at 40 IBU it’s got more hoppy bite than your typical Belgian blonde ale. The hop character here seems to be mostly European noble hops, so I would have to say that this beer still has both feet grounded in the old world. Dubbed a Belgian IPA, Berserker’s vital statistics are not so different from the Buxom Blonde. Like the blonde there are subtle fruity notes here, but the hop character is decidedly more American. After a bit of probing Cameron tells me that they dry hop this beer with a blend of citra, centennial, and amarillo hops. They’ve chosen the hops well because the bright citrus notes in this beer really pop, and the dry hopping adds aroma but not much bitterness. I learn that Berserker was born when a friend of Geoff’s accidentally dry hopped a batch of Buxom Blonde. More than any other this beer exemplifies Zauber’s philosophy of bringing traditional European styles into the 21st Century by tastefully incorporating American ingredients. Moving over to dark beers we next turn to their German alt bier, Myopic Red. Alt bier, which literally translates as old beer, is a style closely associated with the German city of Dusseldorf. As I understand it alt biers are meant to be amber to copper in color, sessionable, lightly hopped, and easy drinking. Myopic Red checks all of those boxes, but to my palate the final product is not very exciting. This is another alt bier, but like Berskerker here they have put an American twist on an old world style. Cameron tells me that to make Stodgy Brown they double the aroma hops (Hallertauer and Nugget) and boost the malts by using a more generous portion of Munich malts, which makes for stronger, darker, and hoppier beer than Myopic Red. Cameron likens it to a hybrid between an alt bier and a hoppy American amber like Red Seal Ale or Nugget Nectar. I do find Stodgy Brown to be a more interesting and appealing interpretation of the alt bier style. Vertigo hefeweizen and Myopic Red alt bier. Some of you are saying, wait a minute porter is a British style right? 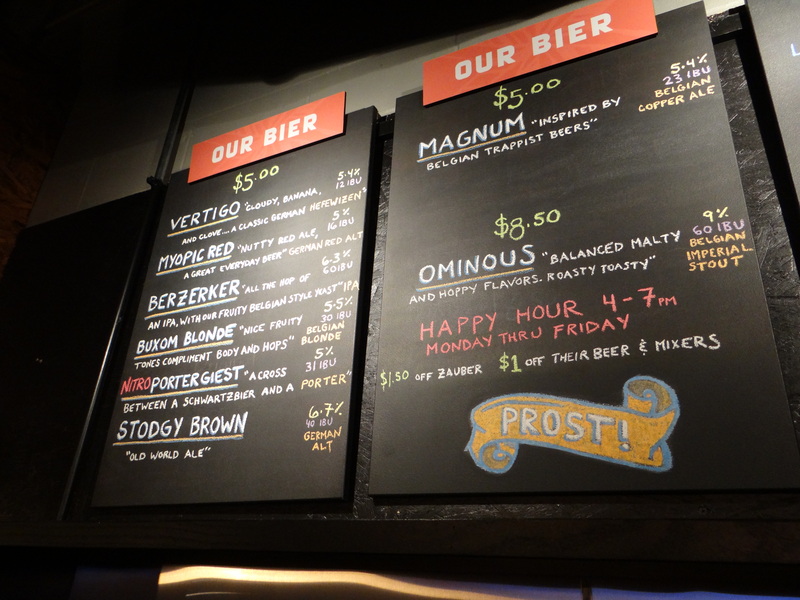 Perhaps anticipating a little grief for sneaking an anglicized beer into the mix, the menu board calls it a cross between a schwarzbier and a porter. Since schwarzbier’s are black lagers and this beer is an ale I’m curious what makes it a cross between the two styles rather than a straight up porter. The answer it seems is the use of Carafa special malts. This malt gives a similar dark color as the chocolate malts that are often used in porters and stouts, but because the barley is dehusked prior to roasting it imparts less roasty, bitter flavor. It’s a malt that is well suited for black IPAs and schwartzbiers. The malt bill, together with the fact that they serve it on nitro, makes for one hell of a smooth, creamy beer that goes down easy. The lack of bitterness from the roasted malts is apparent on the finish. When served on nitro this is another must try Zauber beer. A Belgian abbey ale patterned after the lowest abv beer in the family of monasteric beers, the single. Magnum is copper colored and features bready malts and subtle fruity esters. The Trappist breweries of Belgium rarely sell their “single” to outsiders, brewing it primarily for their own consumption. While they may be rare in Belgium, they seem to be unusually popular here in Columbus, where Magnum has to share the spotlight with singles by Actual Brewing (Temporal) and Wolf’s Ridge (Omega). If you are keeping notes you may have noticed that up to this point the entire lineup of Zauber beers falls in the rather narrow abv range of 5-7%. Billed as a Belgian Imperial Stout, Ominous is their foray into the world of high gravity beers. The inspiration for this beer was North Coast’s iconic Imperial Stout Old Rasputin. Here they have gone in the reverse direction by taking what is essentially an American beer and put a European twist on it by using a Belgian yeast strain. The resulting mix of roasty, chocolaty flavors from the malts and fruity esters from the yeast makes for beer that is unmistakably a hybrid of new and old world elements. While not on tap for my visit I see that they have recently added a märzen and a Belgian golden strong as seasonals. Later in the spring a maibock is planned as a collaboration for the inaugural Columbus Beer Week. If they really want to channel the German beer vibe it seems to me that a lager or two on the menu is needed. When I asked Geoffe about the prospects of adding a lager soon he told me he would love to do so, but at this point in time they simply aren’t able to tie up a fermenters for the long times needed to make a lager. I’ll keep my fingers crossed for a hoppy German pilsner one day. The lineup is a mixture of beers that range from traditional German and Belgian styles to those where distinctly American elements have been incorporated. The fusion of styles have been tastefully executed so that the attributes integrate rather than clash. There is an emphasis on drinkability and what seems to be a conscious effort to avoid in your face flavors. Given the current trends in American brewing I think its safe to say that Zauber is swimming against the tide. Can you build a loyal following around hefeweizens, alt biers, and abbey singles? I guess time will tell, but given the German roots of our city’s brewing history its comforting to know there is a brewery with close ties to German traditions. Excellent and comprehensive post. We look forward too seeing what other beers will be brewing here in the next 6 months and after. There has been an interesting evolution in the styles over the last several months which is an exciting development. It makes sense that Cameron brings new ideas and inspirations to the table which is a boost for the creativity of their beers.